So, I decided to spend my tax refund on home entertainment this year, as TV keeps getting better, whereas movies... not so much. My computer is old, but it still works, and replacing a computer seems less urgent when you have mobile devices. It feels like a long time ago when RAM and processor power seemed so important in order to use the latest bloated software, but now with so many webapps and sites designed for mobile, as long as your Internet is fast enough, you're OK.
Lifehacker says to spend money where you spend most of your time, and I now use my tablet more than my desktop. Also, with all the streams I have access to, there was one chink in my entertainment system -- my TV was not actually big enough to appreciate high definition. Well, it seemed like a good deal in 2007, at $200 more than my new one which is almost twice as big. 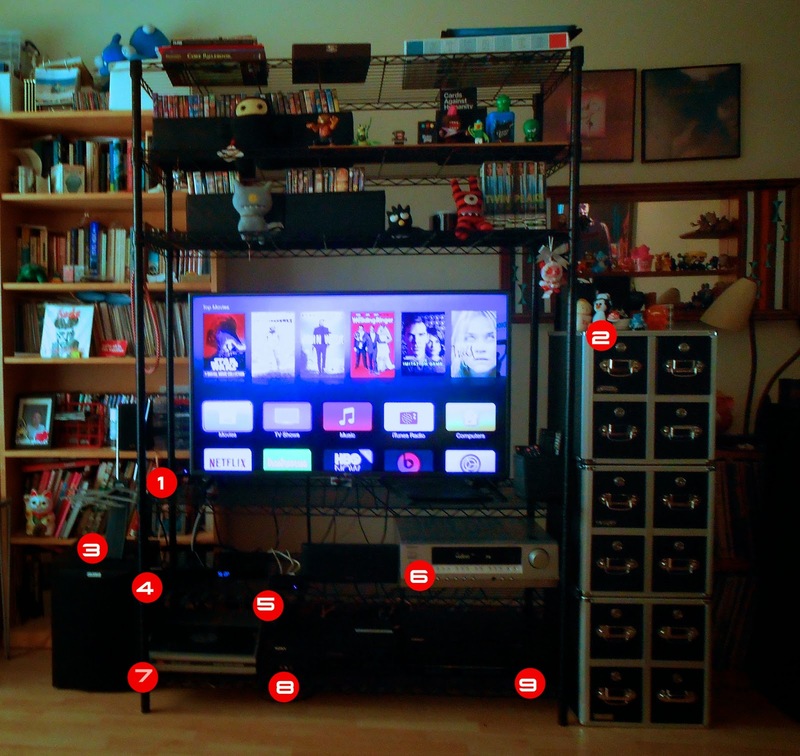 The main thing stopping me was having to get new shelving, as a bigger TV wouldn't fit the current shelves. I was going to go to IKEA, but then I remembered JSeux's love of Menard's, so I tried it first, and was lucky enough to find the exact same color and design as my old wire shelves, just in a larger size. Shout out to my parents for helping me with the measuring, as I have the spacial sense of a drunken hamster. Sturdy-I can break almost anything. Flexible - can adjust shelves where you like, store items in different ways. Open shelves give a sense of space- my place is small. JSeux has also convinced me of the genius of tub-based storage, though I like mine to be pretty. These ones from IKEA were really cheap, but look nice. If I need more space for DVD's or whatever in the future, there is plenty of room on the shelves. My CD shelving was falling apart, so I bought these because of an online comment from a librarian that they were sturdy, plus they kind of look like the old card catalogs. They can also hold CDs in envelopes if I run out of room for cases. Now, I just need an extra digital audio out, since TVs don't have the old red & white anymore apparently. Plus, a switcher, as my receiver's two digital audio ports are filled by the Apple TV and Blu-ray. Although, with my terrible reception, I will probably just watch live TV in emergencies and/or when the Internet is down.